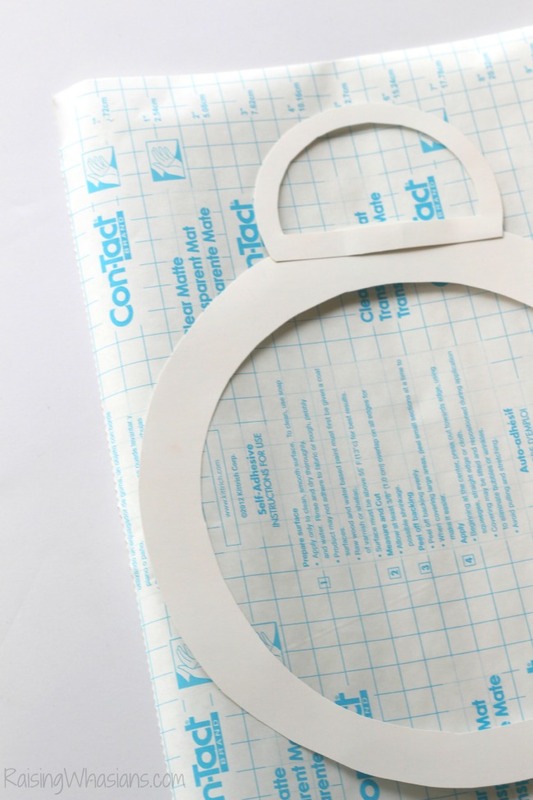 Using a large circle stencil (or in my instance a leftover foam ring wreath), trace onto the white cardstock to make ring and cut out as shown. This is BB-8’s body. Using a smaller circle stencil (or my tupperware lid), trace a semi circle shape onto the white cardstock and cut out as shown. This is BB-8’s head. 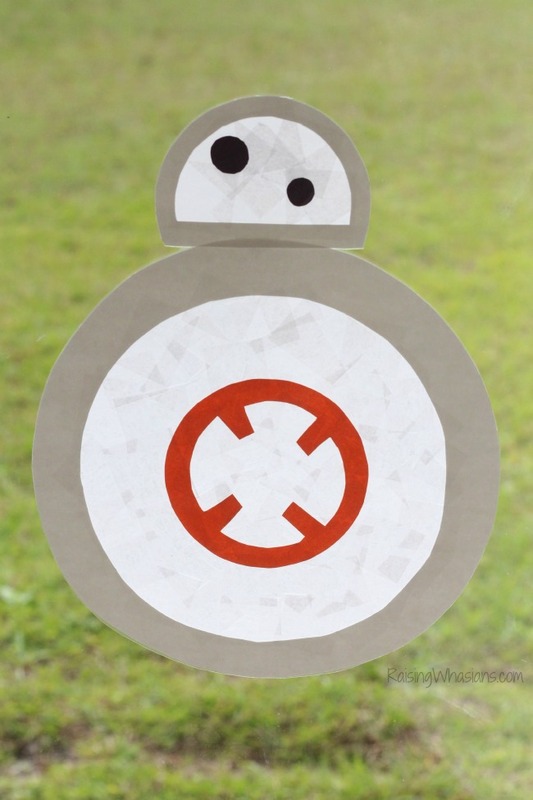 Using the same smaller circle stencil, cut out the above shape into the orange construction paper. Make 2 circles, 1 large and 1 small into the black construction paper. 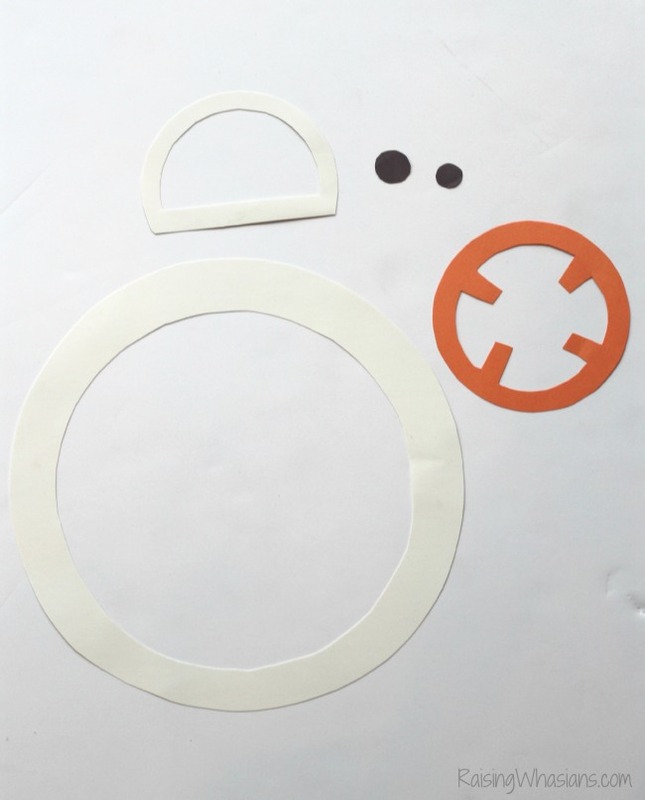 Cut out 2 equal size pieces of contact paper, large enough to lay BB-8’s body and head onto (leaving excess to cut off later). Take off the backing to one of the pieces of contact paper, sticky side up. 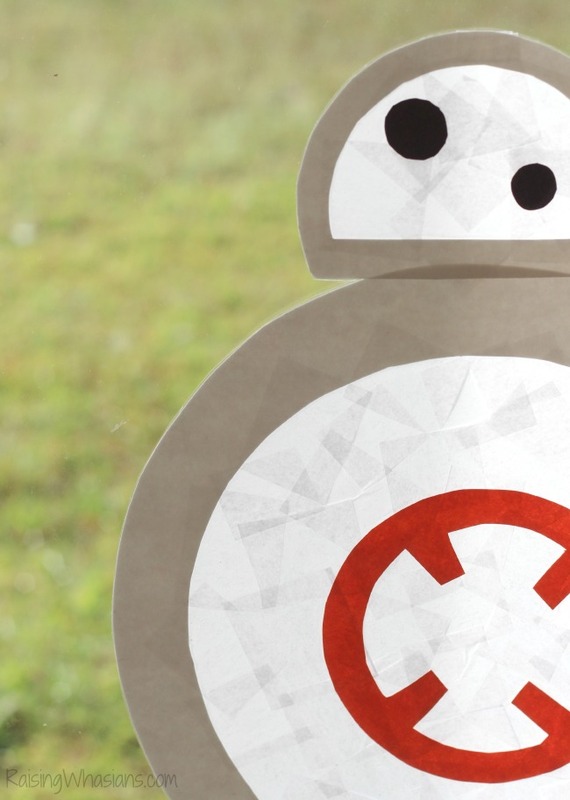 Place the smaller white semi circle on top for BB-8’s head. Right underneath, lay out the large white ring. In the middle of the ring, place the orange shape. Now take your 2 black dots and place inside of the head as shown. Cut tissue paper into equal sized squares. 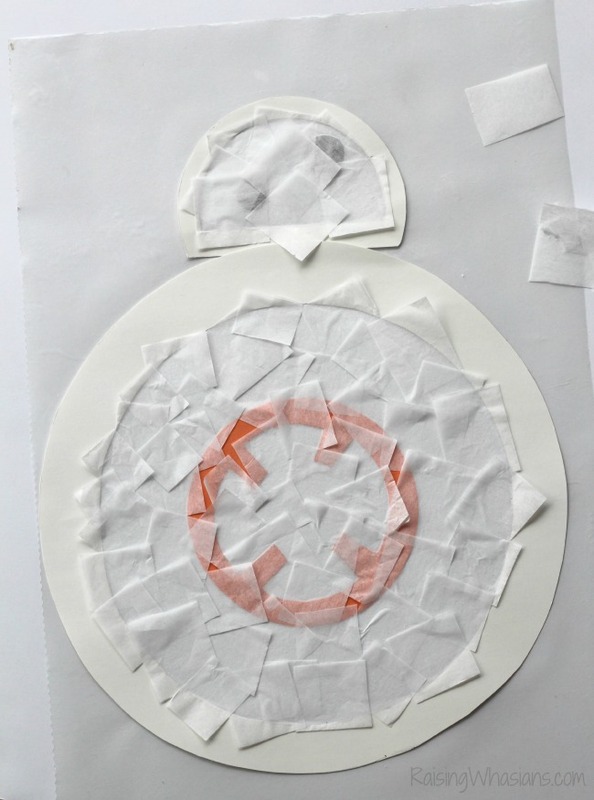 Place tissue paper squares inside the body and head of BB-8. 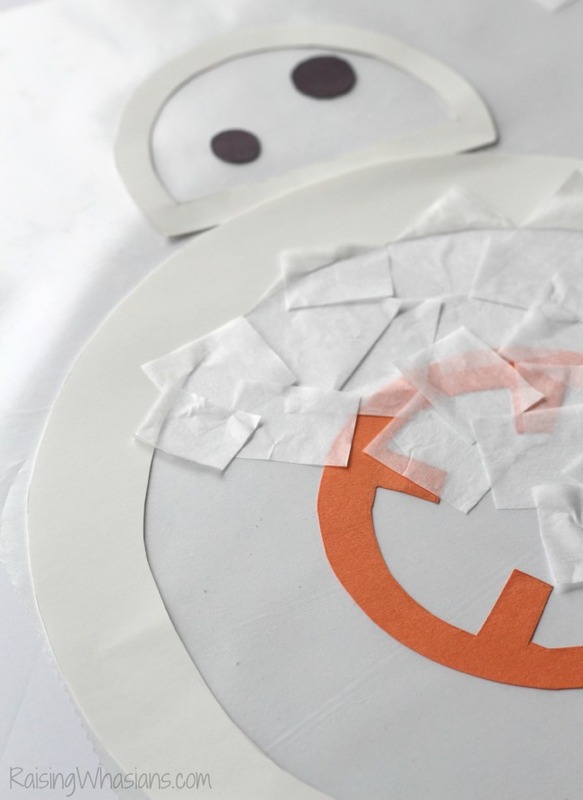 Now cover BB-8 with the other sheet of contact paper, sticky side down and seal. Cut off excess. 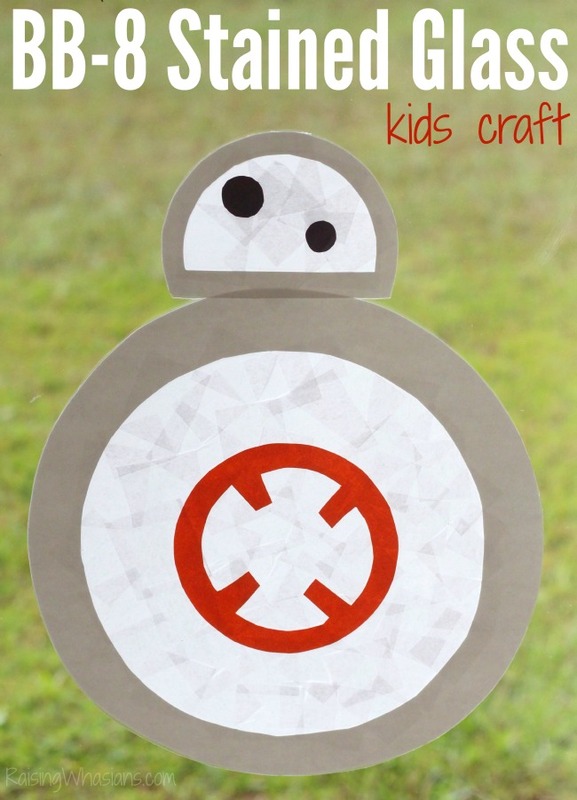 Need some more Star Wars craft ideas? Check out these 22-pages of FREE Star Wars: The Force Awakens printable coloring sheets & activities! 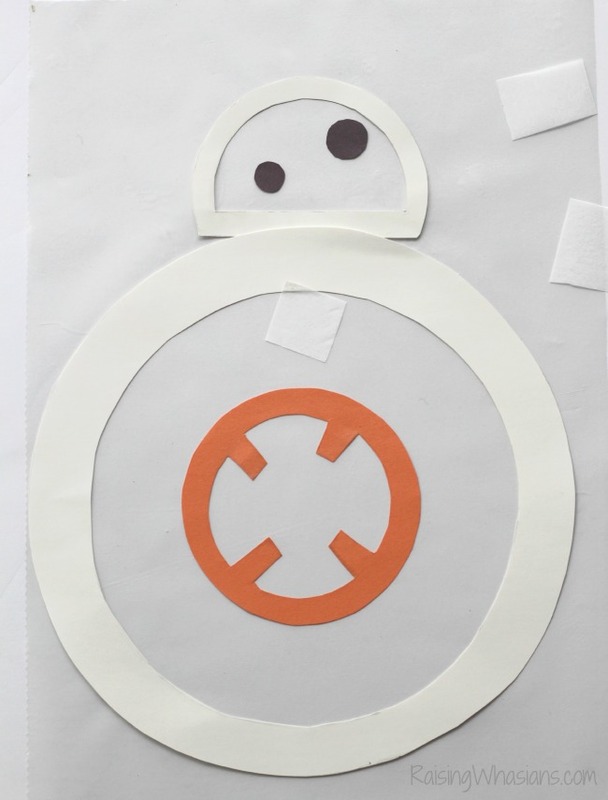 Celebrate Star Wars: The Force Awakens coming to theaters on December 18th with the most adorable new droid, BB-8 and this easy BB-8 kids craft! 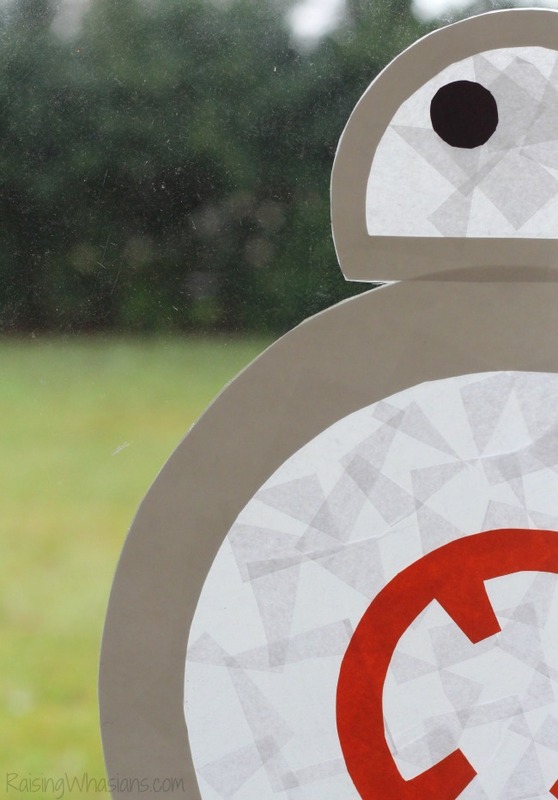 Are you excited about BB-8 coming to Star Wars: The Force Awakens? 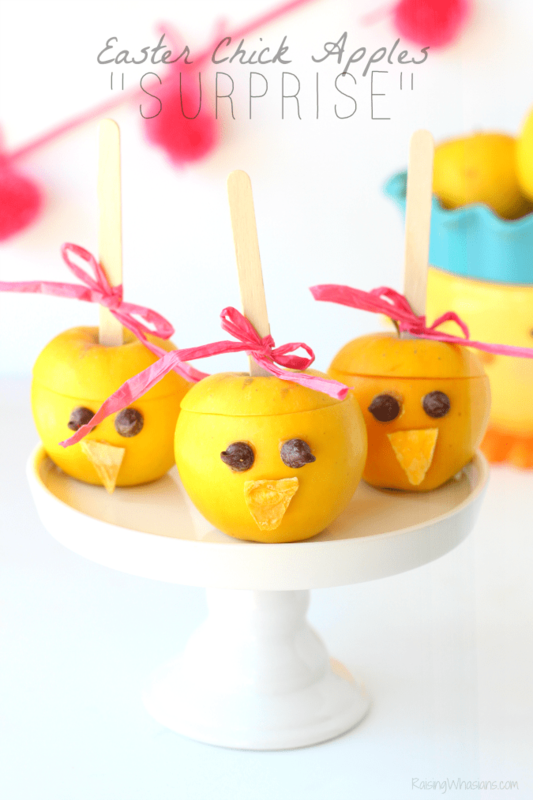 Be sure to follow Raising Whasians via Facebook, Twitter, Google, Instagram, Pinterest and YouTube for more kids craft inspiration! Looking for more Star Wars inspiration? That is so fun. I nanny for a boy who love to make this craft. How cute! I love how you simplified him, but he is still so recognizable. I love doing tissue paper stained glass crafts with my daughter because she can place the paper herself and she loves using glue. We will definitely be trying this soon! Can’t wait to see how it turns out, Katy! I still like R2D2 best. Very fun craft.